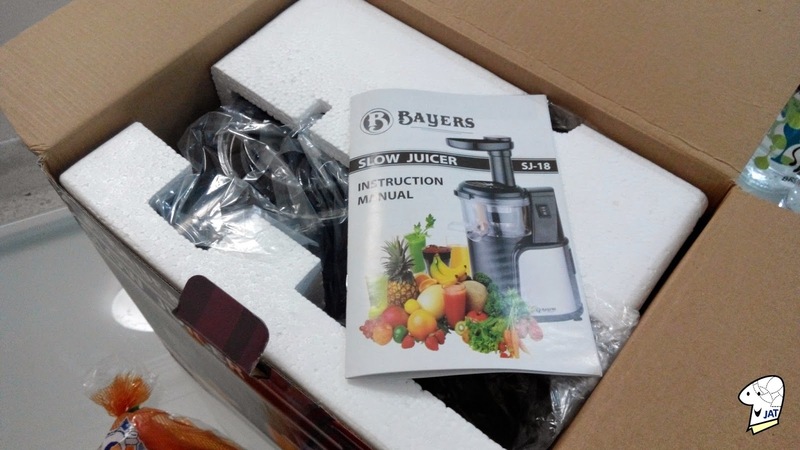 On 28 July 2014, I purchased my first slow juicer, a Bayers Dual Stage Slow Juicer by Zenergy Marketing. It was purchased online from Groupon (www.groupon.my) for RM399. There were many options and different brands available - ranging from RM300+ to as high as RM2000. This was my first attempt to juicing, so I thought I will not spend so much money first. However, if the frequency increases and a better appliance is called for, then I shall invest again in the future. It arrived on 4 August 2014 with Skynet (www.skynet.com.my) local carrier courier service. The package was properly packed with layers of bubble wrap. I was rather excited hence I purchased apples, oranges and carrots to test our my new kitchen appliance. Side view of the box where it explains how it works. Click on the image to enlarge the view. 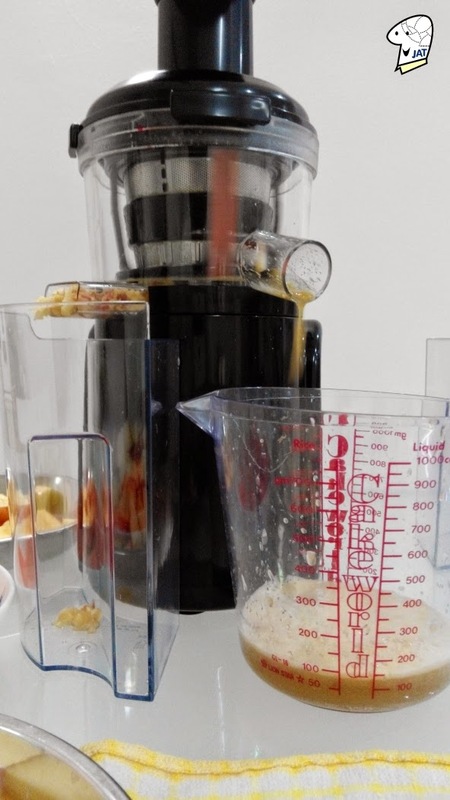 DUAL-STAGE JUICING, Stage 1: Juice is extracted through the first crushing stage then squeezed during the second stage pressing stage; resulting in higher yields of juice and an extremely dry pulp. The secret is in the double-angled auger carefully crafted with precision engineering. SEPARATION, Stage 2: The extracted pulp is then filtered through a metal gauze which only lets through the liquid. 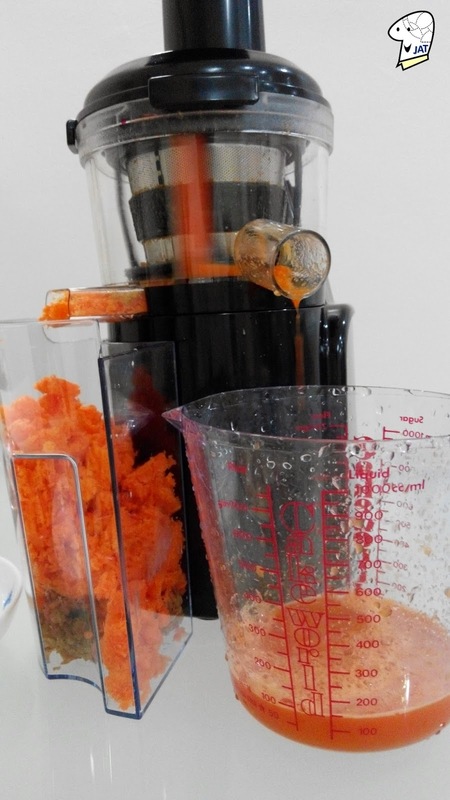 The fresh juice pours into the juice jug while the fiber into the pulp jar. 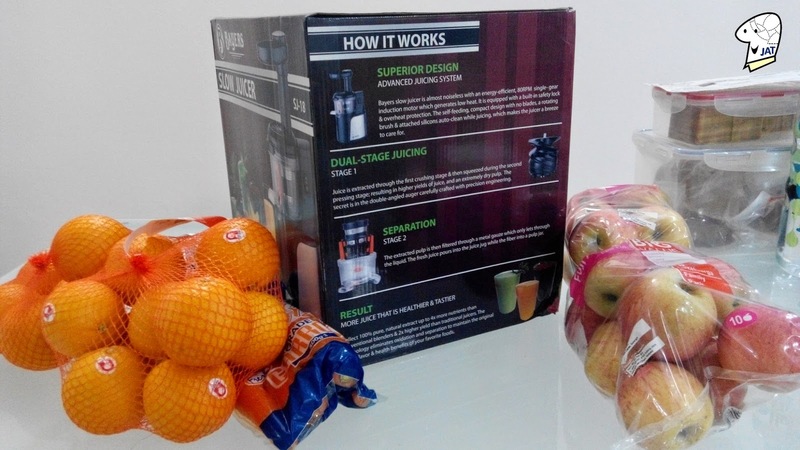 Another side of the box where it shows the different components of the juicer. Click on the image to enlarge the view. The un-boxing. Comes with an easy to follow Instruction Manual. Ingredients to be juiced, apples and carrots. 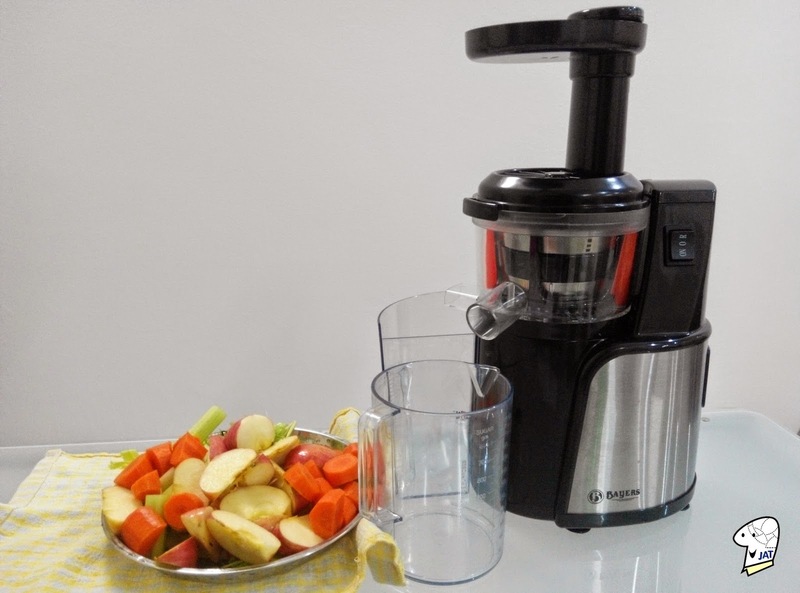 At the base of the juicer are suction cups which holds unto the glass table so that it does not shake or vibrates too much during the juicing process. 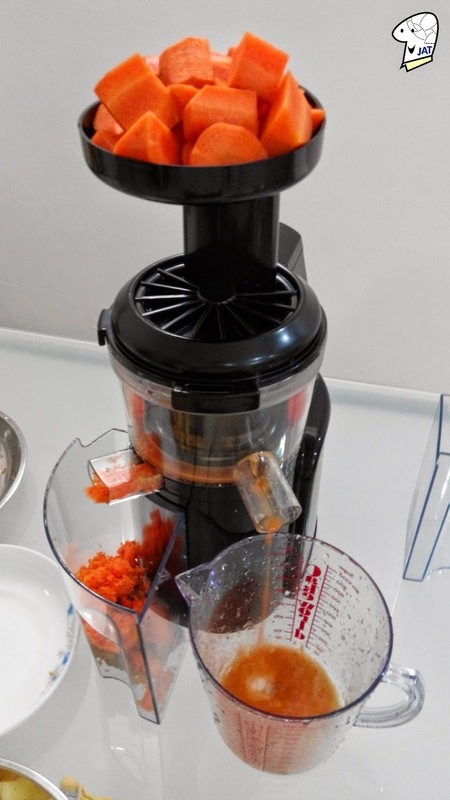 There is a small tray on the top of the juicer (feeder hopper) with allows you to temporary place your cut pieces before inserting them into the feeder. Juice is separated to the circular nozzle on the left side of the juicer while the pulp are directed to the right side rectangle nozzle. The appliance comes with two pitchers / containers for collecting the pulp and juice but I thought it would be easier for measuring the volume of juice produced with a measuring cup. I'm looking forward to experimenting with my recipes and improving my health with delicious juices. hi...so far how's the juicer performance? Is it really can extract out lot of juice? How about the cleaning part? got to use brush to clean the filter slowly? Hi, pretty good so far, been juicing fruits and veggies regularly and it is still functional accordingly. 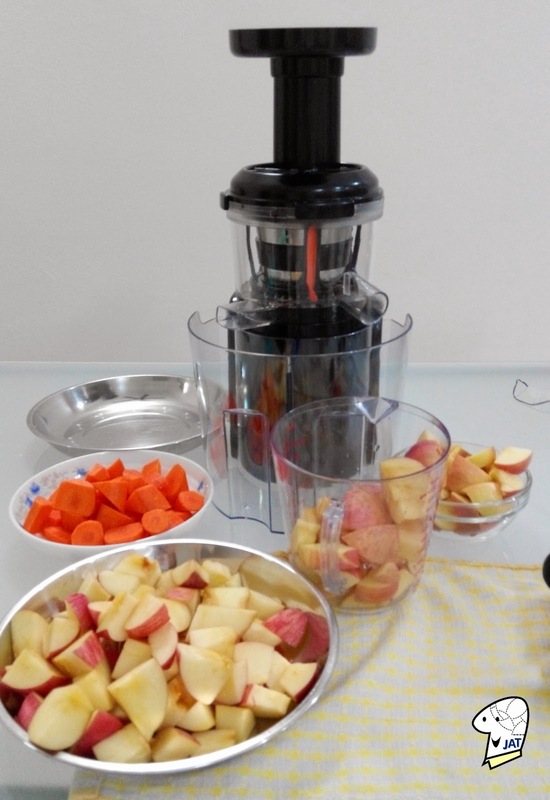 I have the conventional type of juicer which use centrifugal force before getting this one, and one thing for sure is that this one so much cleaner when dealing with the pulp. With regards to cleaning, it does come with a brush (shaped like a tooth brush - which you can see on the image above between the feeder and plunger (after the unboxing). I just use a kitchen cleaning brush to scrub the metal gauge. Hi, thanks for your question, it did not occur to me to check before. I just looked around the Juicer, the box and the instruction manual but unfortunately it does not say where it was made or manufactured. I suggest you enquire from the distributor if you have interest to purchase it. Okay, thanks for your prompt reply. I will send this question to Zenergy Marketing. I bought the same, does your juice come out smooth or gritty? I purchased mine via Groupon and it was supplied by Zenergy Marketing. It's not really smooth, some mashed up pulp does get mixed into juice - I didn't really mind. I would use a strainer if I wish to make sure no residue is in the juice. 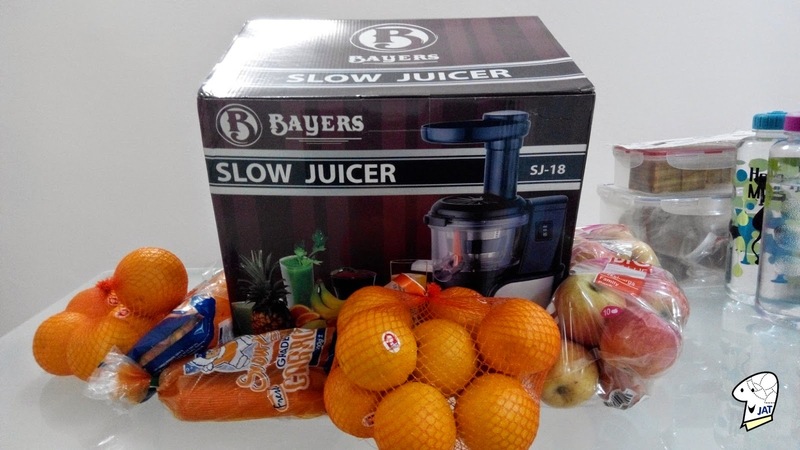 Hi, i'm thinking to buy Bayers coz its not too pricey for a slow juicer. Do you have any problem with juicer or do u have any suggestion in mind? I'd recently saw that it was cheaper at Lazada (RM352) - saw this deal on 26 March 2015. You can try ordering from them and that promotion offers "100% Satisfaction Guarantee" - which means if you're not happy, you can return the product for a refund within the given time frame. Hi, can it be used to extract soya milk? Sometimes there are some residue that comes out at the juice outlet but not the pulp. Have you check if the (orange) silicon flap that is covering the (pulp) outlet is properly positioned? When the feed cover & metal gauze is removed, you should be able push the silicon flap downwards, which will open a gap that lead to the pulp outlet. That's how the pulp is suppose to come out. 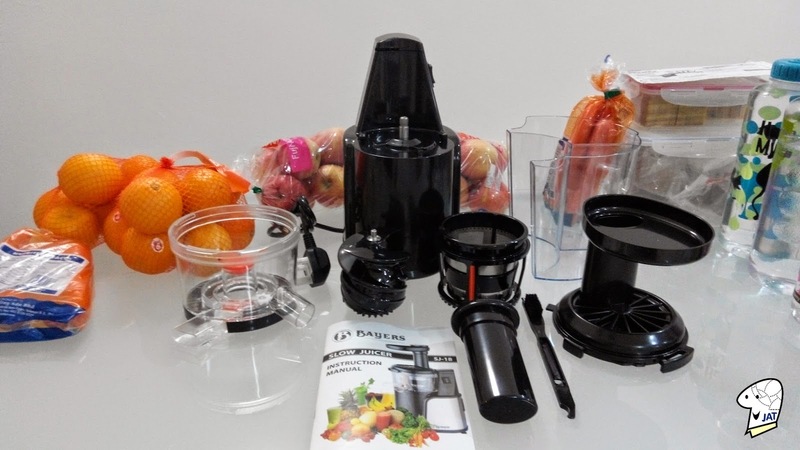 When you're juicing, you can use the manual reverse button to put the motor to rotate in reverse, that sometimes help to align the silicon flap with the hole to allow the pulp to be pushed out. 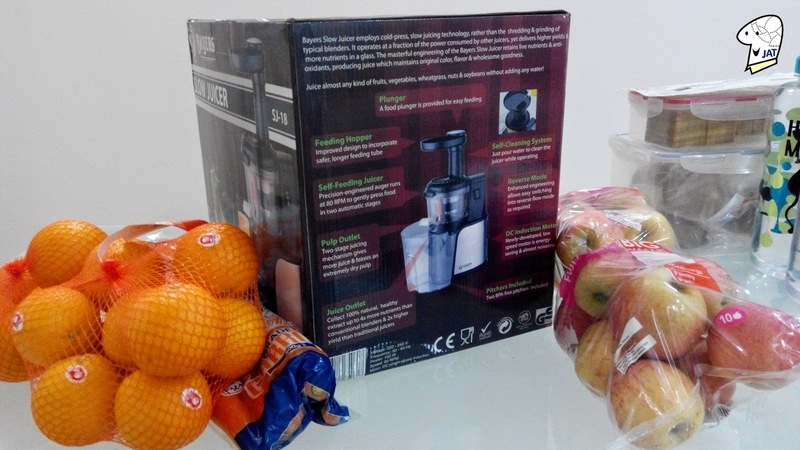 But the special thing ablout this juicer is, that it has a special EPT Technology (Enzyme Protection Technology). Which protects all important nutrients and enzymes and the juices tastes more 'alive'. 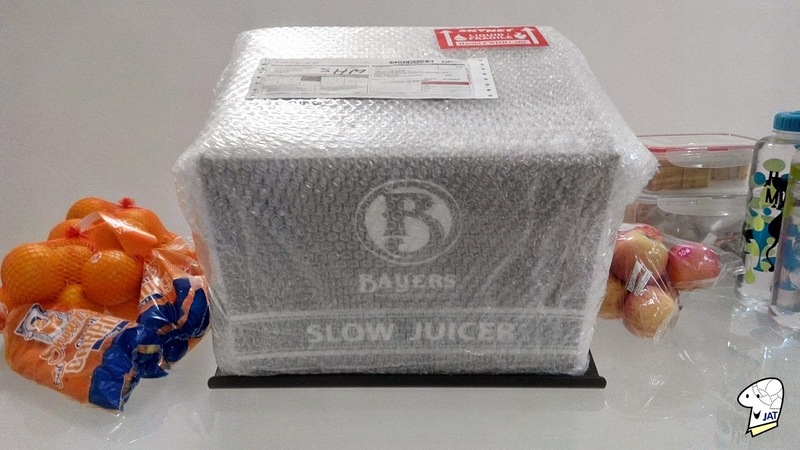 And I think it was also cheaper than the Bayers Dual Stage Slow Juicer.